Summary: Scott Ferdowsi has a track record of quitting. Writing the Great American Novel? Three chapters. His summer internship? One week. His best friends know exactly what they want to do with the rest of their lives, but Scott can hardly commit to a breakfast cereal, let alone a passion. With college applications looming, Scott's parents pressure him to get serious and settle on a career path like engineering or medicine. Desperate for help, he sneaks off to Washington, DC, to seek guidance from a famous professor who specializes in grit, the psychology of success. He never expects an adventure to unfold out of what was supposed to be a one-day visit. But that's what Scott gets when he meets Fiora Buchanan, a ballsy college student whose life ambition is to write crossword puzzles. When the bicycle she lends him gets Scott into a high-speed chase, he knows he's in for the ride of his life. Soon, Scott finds himself sneaking into bars, attempting to pick up girls at the National Zoo, and even giving the crossword thing a try--all while opening his eyes to fundamental truths about who he is and who he wants to be. I first heard about this book when I came across it on Twitter, and it caught my interest pretty quickly. An adventure? Running away from home? Trying to find your life's passion and instead finding a whole new set of adventures? Sign me up! As the summary explains, Scott doesn't want to spend his summer at the internship his parents set up for him. The parents that are so obsessed with him having a successful future as a doctor that they're unwilling to entertain any other possibilities for what Scott can do with his life. And it doesn't help that Scott has no ambition whatsoever, which is why he decides to run away for the summer when his parents go on a trip, and he heads to DC in search of a professor that is well-known for studying "grit" -- also known as perseverance, not giving up, and following your passions to the very end. But while he's on this journey he encounters some roadblocks as well as some new friends, interesting adventures, and even some pretty scary accidents. Now, onto my review. There were definitely some aspects of this story that I really did enjoy reading. The story itself was really heartwarming -- Scott's whole search for motivation in his life really gave me a boost in terms of my own life. I was itching to go add more chapters to my current story every time the topic of hard work and following passions came up, which was often. So that was super helpful and inspirational! I also really enjoyed the setting of this novel. I haven't been to DC in such a long time that I barely remember anything about it, but Ahmadi does an excellent job of painting the scene for the reader and making them feel right at home in the setting. I easily found myself picturing all of the stores and plazas and bars and cafes that the characters in this story visited. I think that aspect of the story was really, really successful. My favorite character in this story was definitely Trent. He was so sweet and kind to Scott and Fiora throughout everything, and he was just an incredibly loyal and dependable person. I love people like that both in stories and in real life, which is why I found myself so drawn to him from the very beginning. I was very delighted when I figured out that he was going to be one of the main characters in this story rather than having a brief, fleeting role -- because seeing him pop up throughout the story and seeing how he fit into all of the chaos that went down was really great. However, there were a few things in this book that made me feel a bit iffy and maybe that's why I wasn't super enthusiastic about it by the time I was done. One of the things that stood out to me the most and bothered me the most was Fiora's character as a whole -- I really didn't like her at all. This book reminded a bit like Looking for Alaska, which is my favorite book of all time so don't get me wrong, that isn't an insult -- but as much as I loved that book, Alaska Young got on my nerves time and time again. Like Alaska, Fiora is reckless, careless, and impulsive, and some of the decisions she makes end up really hurting the people around her, and she doesn't seem entirely sorry about it whenever it happens. She's sort of like "oh yeah, I did that, sorry," and it's just like...no. Girl, no! Own up to your mistakes! Be a good friend! Don't ditch people and leave them hanging! It got really frustrating dealing with her after awhile, to be honest. Also, this is just a really random and super particular thing but every time I heard the word "grit" I was taken back to my sophomore year philosophy lecture and my professor that was obsessed with that term and all of the books about it, so I got bad vibes almost immediately after it was mentioned (and then it continued to be mentioned again, and again, and again....) and that really took me out of the story a little bit -- even though that's a super personal thing that not everyone (or anyone, really) can relate to, but I just felt like sharing! (Spoilers in this paragraph so please skip to the next one if you don't want the story spoiled for you!) I also felt like the ending was incredibly rushed. The last chapter of the book jumps an entire year from the moment Scott gets taken home, and you only briefly get a glance of a recap of what happened when he got home -- but I feel like that was such an important part of the story that seeing it in real-time would've really enhanced the plot, in a way. It would've added an entirely new layer to it. So the ending left me really frustrated because all I wanted was to know what was going to happen to Scott (especially because if I had pulled what he did, my parents probably would've killed me on the spot) and what happened with Fiora. But it seemed like a bit of a copout for her to just drop off the grid and disappear, not even saying goodbye to Scott, even though they seemed to end things on good terms. I don't know. That entire ending just felt really rushed and thrown-together and it left me feeling a bit disappointed because I really wanted to know what would happen without feeling like it was just being glazed over! Overall, I thought that Down and Across was a good book. 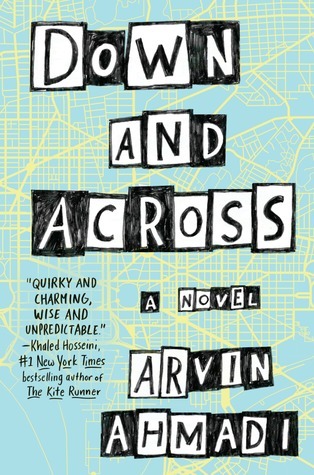 While it may not have exactly been my cup of tea, I can absolutely recognize that Arvin Ahmadi is a successful, humorous author -- there were some parts of this book that I mentioned above that I very much did enjoy -- and just because I wasn't super crazy about this book doesn't mean that you can't love it, so I still encourage all of you to give this book a try and add it to your TBR! Have you read Down and Across? Do you disagree or agree with anything I said in this review? Comment down below and let me know! Giiiirl, the word "grit" was used so many times, reading it became the equivalent of nails on a chalkboard by the end of the novel. Glad to read your review of this one, as it's one I reviewed myself.